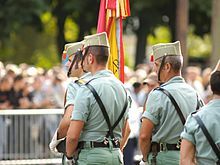 The Spanish Legion ( Spanish: Legión Española, La Legión), informally known as the Tercio or the Tercios, is a unit of the Spanish Army and Spain's Rapid Reaction Force. It was raised in the 1920s to serve as part of Spain's Army of Africa. 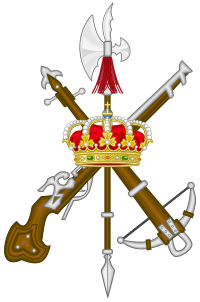 The unit, which was established in January 1920 as the Spanish equivalent of the French Foreign Legion, was initially known as the Tercio de Extranjeros (" Tercio of foreigners"), the name under which it began fighting in the Rif War of 1920–1926. Although it recruited some foreigners mostly from Spanish-speaking nations, it recruited predominantly from Spaniards. As a result, and since it existed to serve in Spanish Morocco, it was soon renamed Tercio de Marruecos ("Tercio of Morocco"). By the end of the Rif War it had expanded and again changed its name, to the "Spanish Legion", with several "tercios" as sub-units. 2nd Tercio " Fernando Alvarez de Toledo, Duke of Alba"
3rd Tercio " Don Juan de Austria"
4th Tercio " Alexander Farnese, Duke of Parma"
The Spanish Legion is now mostly used in NATO peacekeeping missions. It has 5,000 soldiers in a Brigade of two Tercios (regiments) based in Ronda, Málaga and Viator, Almería ( Andalusia). Two other independent tercios are deployed in the Spanish African enclaves of Ceuta and Melilla as part of their respective garrisons. The legion is directly controlled by the Spanish General Staff. 2nd Spanish Legion Light Armored Cavalry Group " Reyes Católicos"
3rd Spanish Legion Tercio " Don Juan de Austria"
VIII Spanish Legion Bandera " Colón"
4th Spanish Legion Tercio " Alejandro Farnesio"
X Spanish Legion Bandera " Millán Astray"
1st Spanish Legion Tercio " Gran Capitán"
2nd Spanish Legion Tercio " Duque de Alba"
The modern legion has the same camouflage dress for active service and ordinary duties as the rest of the Spanish Army but retains the unique, sage green Tropical uniform for semi-formal barrack dress and as the basis of Legion parade uniform. Perhaps the most distinctive feature of the modern legion uniform is the khaki "gorrillo" cap or " chapiri", with red hanging tassel and piping. Under the command of José Millán-Astray, the legion's motto was ¡ Viva la muerte! ("Long live death!") It fell into disuse after the death of Francisco Franco.